Smell a freshly cut cigar as you snap your XIKAR� cutter into its locked position. The spring-loaded, double guillotine design gives the cutter feel and performance like no other. A button release mechanism snaps the two super-hard stainless steel blades into the open position. Many cigar cutters leave trailing pieces of tobacco on the lip of the cigar. Others don't cut enough of the tip to allow an even, smooth draw. Almost none of the cigar cutters on the market will accommodate the large cigar sizes preferred in the USA. 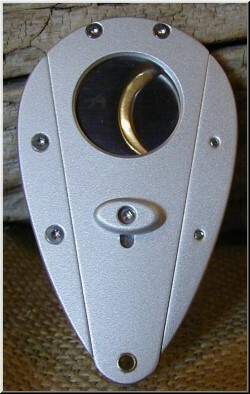 Like a proper wine glass enhances a good wine, an excellent cigar cutter promotes the full performance of fine cigars. Why would a cigar connoisseur who spends $10 to $35 per cigar use anything but the best cutter? Lack of the proper tools and knowledge prevents it! Aluminum body. All Xi cutters are the same ring gauge: they will cut a 54 ring gauge cigar in half. Depending on how much cap you cut, they will cut up to a 58 ring gauge cigar.